Boil your pasta as per manufacturer's directions. Pasta should not be al dente - it should be a little softer than it would for a hot pasta meal. Set pasta aside to cool. We prefer to steam peas. You may prepare them by your favourite method - in a microwave or cook barely covered in water. Leave peas snappy - still firm enough that they won't break apart when mixed into the salad. Set peas aside to cool. Break imitation crab apart large enough so that there are nice pieces in the salad. Too small and it gets lost in the salad. Once all ingredients are cooled, add those, with your celery, onion, and any other fresh vegetables, to the bowl. Mix ingredients together by lifting them, gently, from the bottom with your fingers. To the mixture - add 1/2 C mayonnaise, 1/2 tsp salt and about 1/2 tsp freshly ground, mixed peppercorns. Stir it all together, very gently, by lifting everything from the bottom being careful to avoid breaking delicate ingredients (such as imitation crab, peas or pasta). Add one tablespoon of mayonnaise at a time - mixing the salada, as described in step 6 - until the desired level of creaminess is reached. Fine tune your seasoning as needed. Be mindful that these flavours will come out more as the salad ripens. A little diced red bell pepper will add nice colour to your salad. Small salad shrimp (no larger than 70/90 may be a nice alternative to imitation crab. 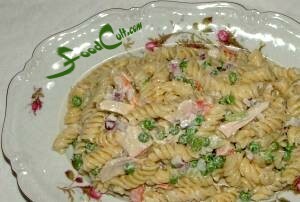 Pasta salad is one of those great party foods. More than just a party food, it falls into the "comfort food" category for us. While a little time consuming, it is very easy to make and, once again, the limitations are always your own imagination. Our favourite is with peas and crunchy things like red onion and celery. We like, as well, the flavour that comes of imitation crab. As you experiment, you will find the flavours that appeal, best, to you! You can always go get some Wallpaper Originals' Free Food Desktop Wallpapers for Mac & PC - now that you've found the web's best and easiest Pasta Salad Recipe.